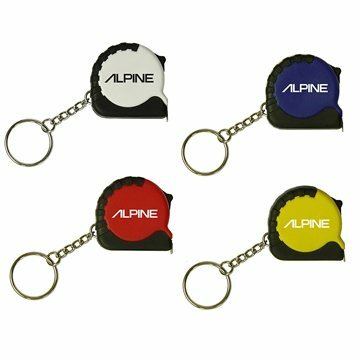 Carry your business far when you add your company name or logo to these portable tape measure key chains! Featuring a locking mechanism and 39" metal tape length, the pocket-sized repair tool would be an excellent giveaway at the next tradeshow, convention or career fair you attend. The availability of color options provides ample opportunity for customizing to your project needs. Ideal for contractors, home improvement stores and fashion designers. Like that you were able to ship quickly. No negatives. the product was exactly as portrayed on the website and via the proof there were no surprises and overall the experience was painless and worry free. It was a pleasure doing business with AnyPromo. These were sent timely and looked just as expected. Price was great and it looks very professional. I knew this order was a great price for the quality. Top quality and appears great.